Robotics is the branch of technology which deals with construction, design, operation, applications of robots. Robotics includes mechanical engineering, electronic engineering, computer science, information engineering departments. Robotics technology is used to develop machine which can be a substitute and replicate human actions. Why KaaShiv InfoTech Company to learn Robotics Training in Chennai? Kaashiv provides Best Robotics Training in Chennai with professional trainers who provide real-time training and also projects to the candidates for better understanding. 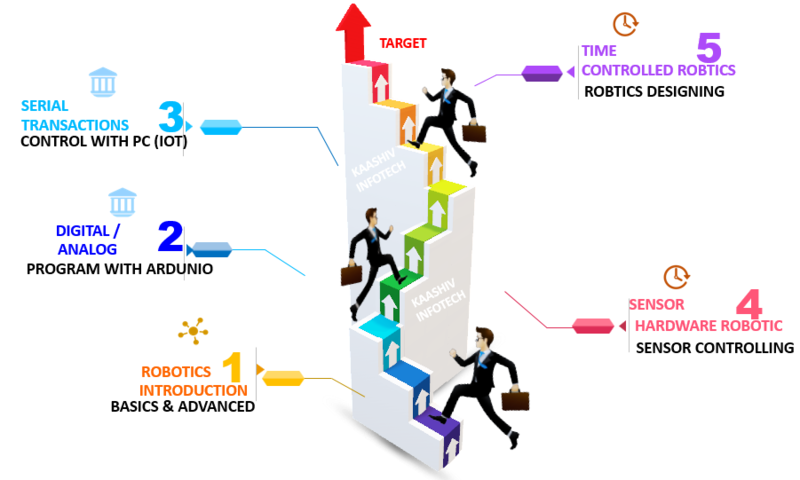 Why Students Enroll for real time Robotics Course? The goal of robotics is to design an effective robot. Robots replaces humans from dangerous work which is multi-functional and can be re-programmed. Kaashiv offers a platform to learn Robotics training in Chennai by practical sessions and also training in Live project. Learn and Implement 120 Concepts Covering ROBOTICS Technologies. Students undergone Robotics training will be expertise in Robotics Specialist & Arduino Programming + real time Electronics Implementation. For Robotics Training 120 concepts from Basic to Advanced will be covered.